A few weeks ago, The McGill Daily published an article about “woke capitalism,” or the practice of appealing to consumers seeking the social capital that comes from being socially aware. This article will continue that conversation. Capitalism is a political system in which private corporations, rather than the government or the workers, control industries and the means of production. In theory, this does not seem inherently negative. However, in practice, capitalism allows for businesses to be virtually unrestricted when it comes to the treatment of their employees. While most Western countries have laws preventing certain human rights abuses, corporations’ control over the industry gives them undue political sway in how laws are written. Labour laws therefore contain loopholes that allow for exploitation regardless. All material consumption in a capitalist society plays into this system of exploitation. While there are brands which truly are less exploitative than others, their mere existence as for-profit corporations hurts marginalized people. Factories are often located in Majority World countries, where populations, and therefore employees, are not white. Through systemic oppression, racialized communities overseas end up coerced into performing cheap, exploitative labour under capitalism. Even within Minority World countries, the institutional racism inherent to capitalism creates exploitative labour through poverty wages and poor working conditions which are exemplified in sweatshops. As people of colour in the West are not afforded the same opportunities as white people, they are often overrepresented in underpaid and dangerous types of jobs. While there are brands which truly are less exploitative than others, their mere existence as for-profit corporations hurts marginalized people. The most obvious example is Nike, who has hired Black Lives Matter activist Colin Kaepernick as their new spokesperson. Kaepernick’s slogan is “Believe in something. Even if it means sacrificing everything.” But Nike’s supposed activism hardly constitutes sacrifice; online orders of their products rose 27 percent compared to the previous year. Meanwhile, they have not addressed allegations of human rights abuses directed against them. As recently as 2017, the Fashion Transparency Index gave Nike the lowest possible score due to the poverty wages they pay their workers. Beyond being underpaid, Nike’s labourers in these Majority World countries have also been subject to inhumane working conditions, such as working in 37°C heat during ten-plus hour shifts, six days a week. In many cases, this has led to serious health consequences for these predominantly racialized workers, who are often working under precarious short-term contracts and cannot file reports against their employers without losing their jobs. Yet Nike’s revenue continues to rise as a direct result of their performative allyship. Many other brands have also participated in woke capitalism, selling clothes with messages which are not reflective of their actual human rights records. Forever 21 has been accused of gender discrimination and transphobia. Yet, Forever 21 is currently selling over a hundred different rainbow-printed items. And no, their designers don’t just like rainbows. Search “LGBT” on their website and you’ll see everything from skinny women in rainbow-striped thongs to skinny girls in rainbow shirts that say “girls for the future.” Recommended for me is a t-shirt which reads “What I want / what I really really want / is equality” and ironically costs more in “plus” sizes than in smaller sizes. This isn’t an isolated incident, for-profit corporations cannot, by definition, prioritize anything over their revenue. 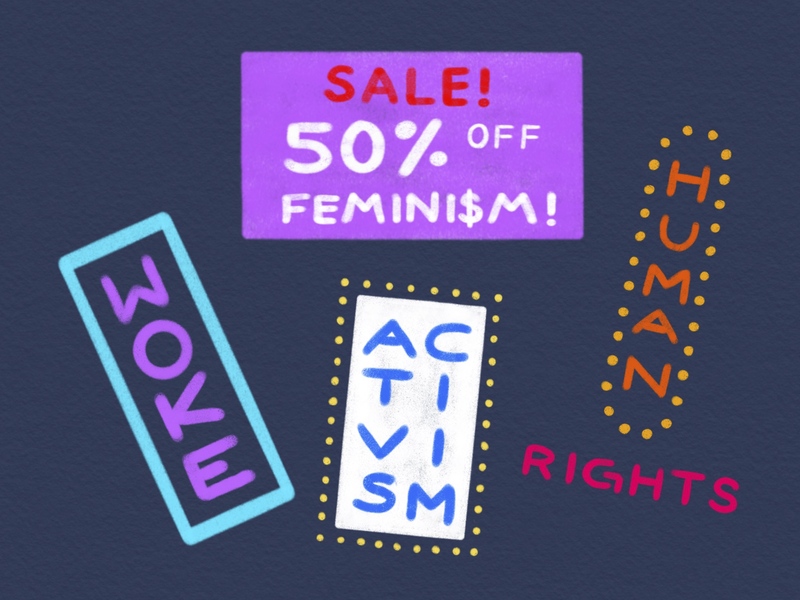 Rebranding corporations as “woke” has been taken further by brands such as Feminist Apparel. The company exclusively manufactures products featuring catchy feminist slogans, such as “pizza rolls not gender roles” and “men of quality respect women’s equality.” They use popular symbols, such as the pride flag and Rosie the Riveter, which have been adopted by young activists. The website clearly states that consent is “clear, conscious, and enthusiastic,” and that we should “talk about consent.” However, the company’s founder and CEO must not be a man of quality; he is an admitted sexual abuser. When confronted and asked to resign by his employees, he fired them all without notice or severance. Beyond this blatant disregard for employees’ rights, Feminist Apparel showed that when forced to choose between ethics and profit, they chose profit. This isn’t an isolated incident, for-profit corporations cannot, by definition, prioritize anything over their revenue. Do the people who buy these things know that they’re supporting and perpetuating the very injustices they claim to oppose? Do they care? Most consumers of “woke” clothes are privileged enough that they don’t need to worry about how their things are made, who they’re made by, and what impact their purchase has on the lives of others. “Activism” that uses money to buy feminist shirts and LGBT Macbook stickers while not engaging in anti-oppressive practices is just performative allyship. After all, performing wokeness is the easiest way to achieve “good person” symbolic capital, and doesn’t require much time, energy, or desire to actually create change. The failure to recognize the inherent exploitative and performative nature of woke capitalism not only commodifies activism, but also perpetuates cycles of oppression. Actually participating in activism, however, requires both physical and emotional labour. “Activism” that uses money to buy feminist shirts and LGBT Macbook stickers while not engaging in anti-oppressive practices is just performative allyship. Yes, the use of young people’s activism by corporations as a new way to make profit is wrong and should be acknowledged. However, while existing in a capitalist system, everyone can make choices that combat capitalist exploitation. Owing to privilege, it isn’t fair to expect everyone to make the same less-exploitative choices, but no one is entirely powerless. You can buy things used, you can use trading groups on Facebook to get rid of things you don’t need in exchange for things you do. If you have to buy something new (I just don’t want used underwear and I can’t shame anyone for feeling the same), do your research about which brands you choose. There will never be ethical capitalism, and consumers need to recognize that and take their impact into consideration every time they buy anything. Giving up and just buying a cheap tee with a pseudo-feminist slogan is certainly not a solution.